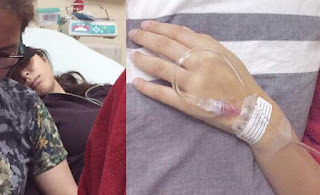 Kathryn Bernardo was rushed to the hospital according to the actress' mother, Min, who posted a photo of her daughter with a dextrose tube in her arm. The photo was shared via twitter, hoping for her daughter to feel better soon. After a few hours, she then informed everyone that her daughter's laboratory tests were good. There are no reports yet as to why she got hospitalized and whether or not she is still confined at the hospital.